Have you ever had a case of the slumps? For me, a case of the slumps looks like this: I eat junk food, I don’t exercise, and I spend a LOT of time in front of a screen. At first, this feels fun and indulgent, but after a day or two, I slump. I feel lethargic and dull– sometimes even hopeless. I know now that these emotions tell me I’ve run out of fuel, but I’ve had to go through the case of the slumps many times before understanding that message. The week before Michael left, I paid a visit to my angel of a therapist. I told her that I knew a case of the slumps would be waiting for me after he left on his trip. “Well, yes,” she answered pragmatically, “so you need to come up with a game plan before he leaves.” So I did. 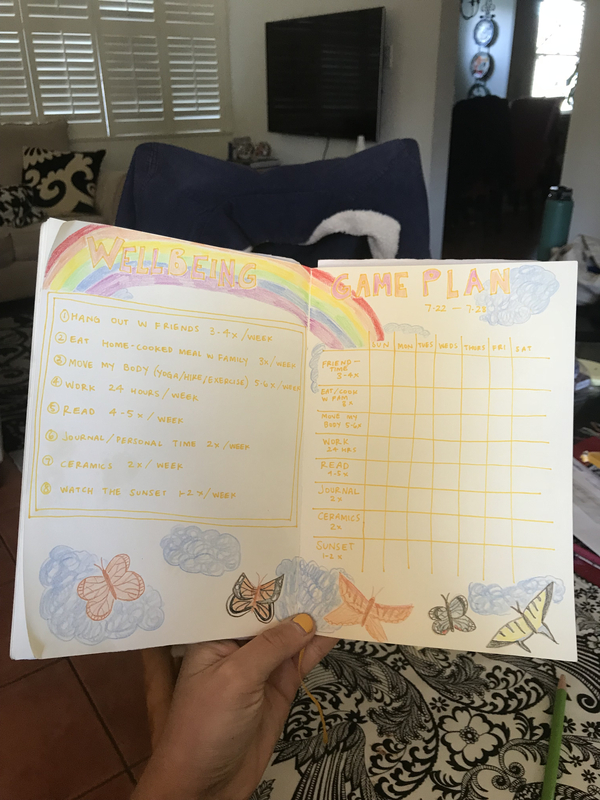 I bought a nice new journal, some colorful markers, and I created my “Wellbeing Game Plan”: a prescriptive formula for keeping myself healthy during Michael’s absence. Creating wellbeing for myself is my goal while Michael is gone, but you may have another goal in mind. Toward what goal could you use a little more action, discipline, and inspiration? What _____ Game Plan could give you the boost you need to thrive? Where in your life could you use a GAME PLAN? 1. Make a name. Choose a goal from last week for which you want to make a game plan, and name your Game Plan after that goal. 2. Add your prescriptions. What “medicines” can help you go through your obstacles? I chose going to yoga, seeing friends, scheduling in down time, reading and taking morning journaling and meditation time. My friend, who also created a Wellbeing Game Plan, added watching the sunset to hers. Choose 5-10 tools you want to practice regularly to get closer to your goal. 3. Choose how often. How many times per week can you do each activity to maximally benefit? I found I’ve had to adjust mine a little bit over these weeks, so be open to flexibility 🙂 Remember that you have lots of other obligations in life, too! 4. Represent it. Write/ draw/ create your game plan somewhere you can come back to it regularly. Have fun making it look like something you want to look at! 5. Create a weekly chart. The first week I tried my wellbeing game plan, by Wednesday I realized I wasn’t doing much on the list. I decided to make a chart to keep track of what I had accomplished each day, and I make a new one each week. I put x’es to keep track each day, but my friend actually found cute stickers to put in hers that she loves! The chart, as with an accountability tool, increases the chances of following through. 6. Decide how long your game plan will last. Do you want to try your game plan for a week? For a month? Have compassion for yourself by creating an attainable goal. You can always decide to extend it later! 7. Share you game plan + inspire others! Post a picture + see others’ game plans on the Emotional Intelligence Network on Facebook! Put on your game face… you’ve got a world to change! What insights did you gain from creating your game plan? Do you foresee any challenges for yourself in using your game plan? For example, being too lax about it or too rigid? If so, what tools will help you move through that challenge?